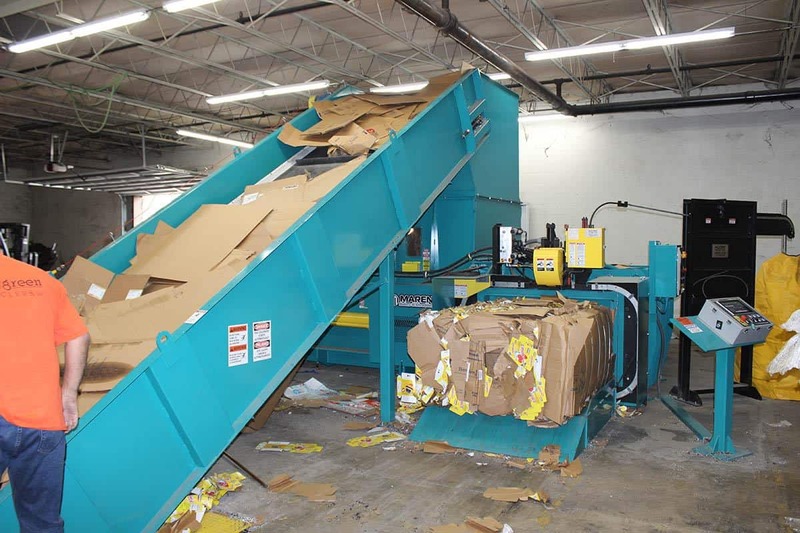 Large “Wide Box” (57” W x 64” L), clear opening with standard tongue and groove floor, ideal for both post-Industrial cardboard and scrap metals, while easily processing paper, fiber, plastic and other recyclables. Interlocking plate steel construction distributes stresses away from welds to tabbed locking joints. Chassis floor and sides constructed of seamless single sheet plate steel. Replaceable “AR” hardened wear liners allow for limitless replacement of all chassis wear surfaces for years of reliable service. Multi edge replaceable shear blades reduce cost by allowing blade rotation to gain additional new cutting edges before blade replacement. Extended progressive cutting profile shears material over a long distance effectively reducing shear jams. 400 gallon floor mounted hydraulic oil reservoir shipped full of oil. Clogged oil filter sensor, high oil temp sensor and low oil level sensors automatically protect your investment while notifying the operator attention is needed. 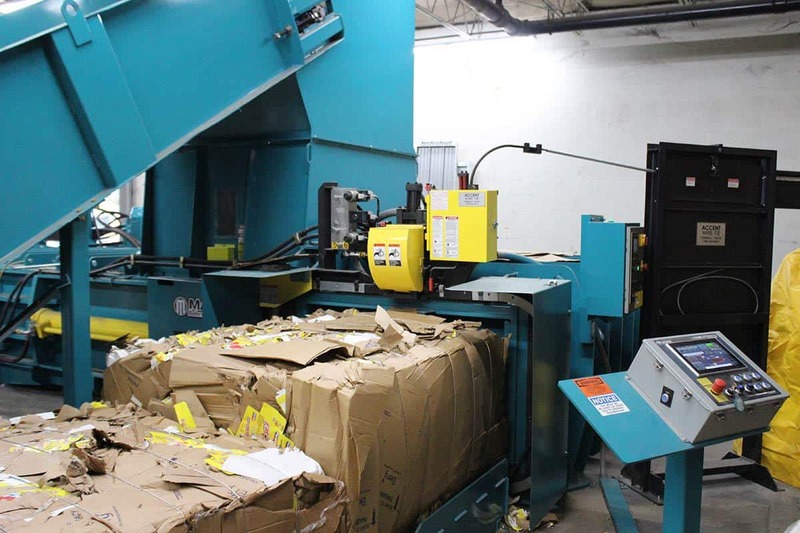 Robust ram and door position transducers allow automatic control of bale size, final bale finishing, shear jam prevention, wire placement and bale ejection. Bale separation door facilitates instant material changes and virtually eliminates cross contamination between bales. The door’s transducer positioning allows up to 13” oversized bales to eject without jam, yet closely guides the bale to the tier for tight bales and reduced fall-off. All safety E-Stops and contactor resets monitored by a dual redundant safety relay system. Motor: Dual 20 hp or 30 hp TEFC 3 Phase motors generate 40, 60 hp. Motors automatically stage start to reduce surge on electric service. During low production demand motors can be de-selected to reduce overall electrical consumption and through-put while maintaining 100% bale weights and shearing performance. Hydraulic: A simple but innovative hydraulic system allows the 2R210 to run faster and more efficiently while being more serviceable. highly efficient piston pumps rated for 5,100 psi run at only 4,200 psi ensuring less stress and long life. All pumps are mounted below tank level to eliminate start-up cavitation and extend pump life. Hydraulic System: High Efficiency Regenerative. Maren’s SmartBale Intelligent baler control allows password protected saving of a complete set of parameters for each commodity to be baled. 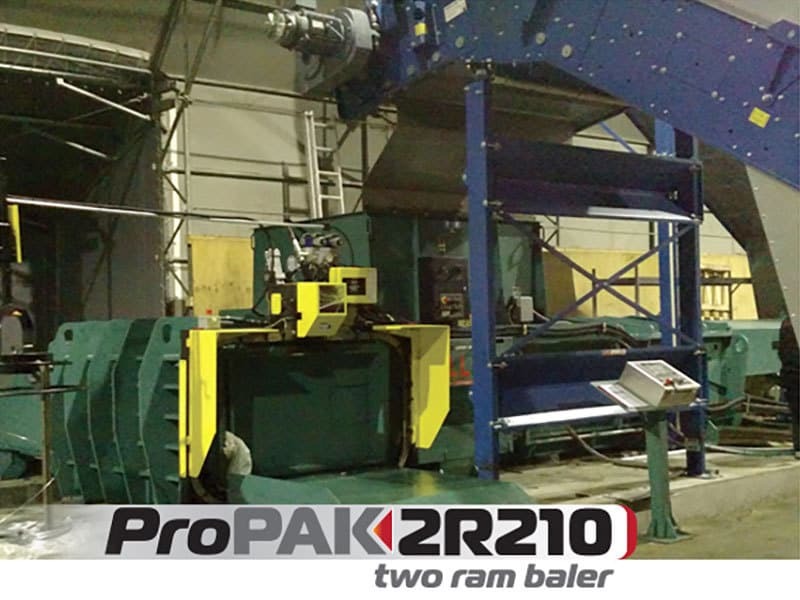 At run time the operator simply selects the proper material from a drop down list and the ProPak 2R210 automatically configures for the commodity to be baled. 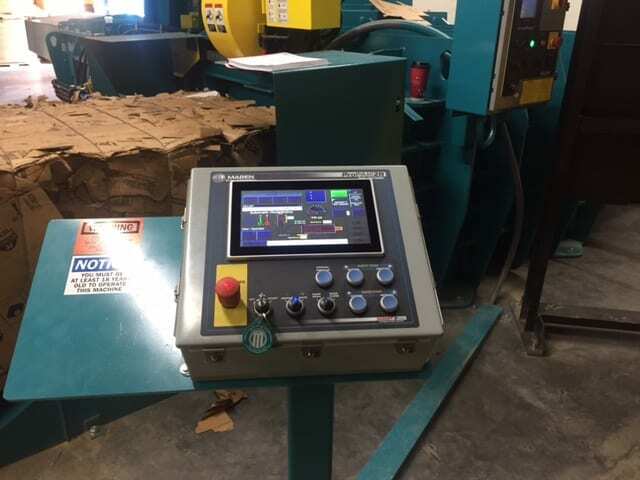 Settings automatically adjusted include wire count, wire placement, baling pressure, bale size, photo eye selection, conveyor speed, multi motor settings and many more. Displays statistics such as current bale size, remaining for full bale, average charge and largest charge, all helping the baler operator make easy cleanup free material changes. Password protected maintenance screens accessible to onsite maintenance staff allow further customization and simplify troubleshooting with troubleshooting screens for inputs, outputs and other statistics. * Bale Weights are approximate, and may differ with moisture content, material density, etc. * Due to Maren’s commitment to product quality and refinement, these specifications are subject to change without notice, and without incurring responsibility to units previously sold. NON INSULATED COPPER WIRE 5,800 lbs. 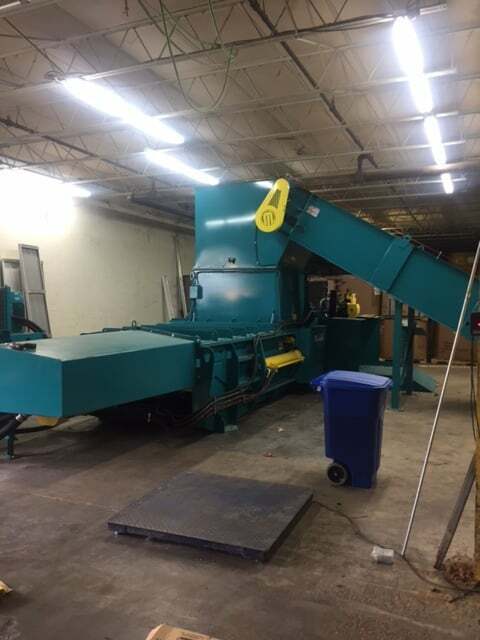 Maren Balers & Shredders © 2019 Maren Engineering, Inc., All Rights reserved.